Elevate your next production with aerial media. 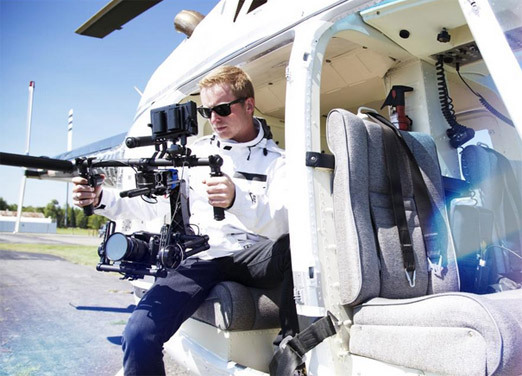 We provide all types of productions with 4k - 5.2k quality aerial video by drone or helicopter. With over a decade of flying experience we can supply creative and engaging aerial video for all types of video productions. Drones can be used for all sorts of productions such as: Feature Films, Television Shows, Live Television, Commercials, Marketing / Advertising, Film Scouting, Indoor Interior Drone, Beauty Shots, Construction Progress, Property Developers, Real Estate, Marketing, Live Sports, Insurance Damage Assessment, Aerial Inspection, Golf Courses, Personal Property Documentation, Estate Photography, Concerts, Live Events, YouTube Live Broadcasting, Drone Inspection, Legal / Forensic Data Collection, Weddings Proposals, Aerial Data Collection and more. 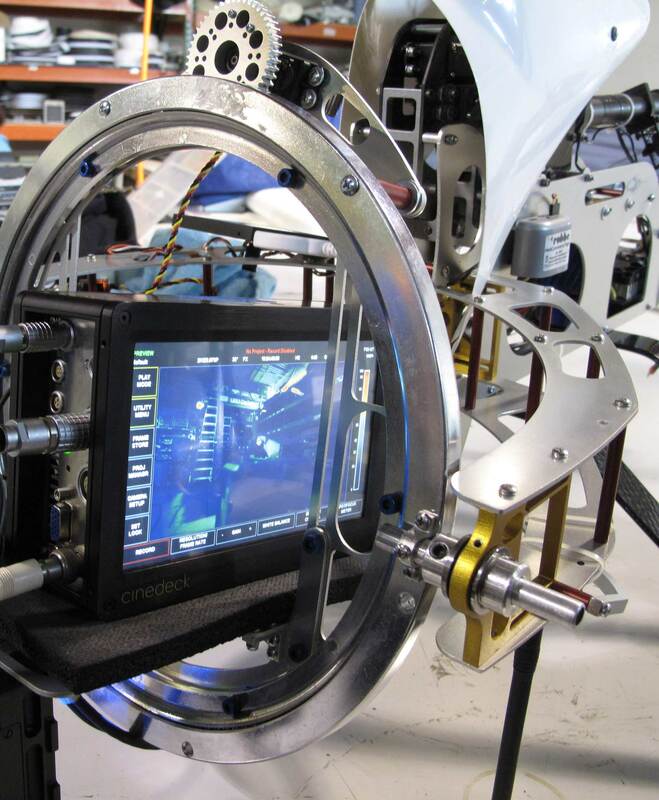 Large Commercial Productions such as Film, TV and Commercial clients want to know... What kind of cameras can we fly? For a non-integrated camera drone we can fly any camera under 12 lbs including the RED Epic, Red Scarlet, Red Dragon, Alexa Mini, Canon 5D Mark III, Sony FS100, Sony FS700, Black Magic 4k, Canon 1D, Nikon D4 and many more... We can film aerials for features in quality from 4k - 5.2k and even 6k video using our "SkyJib X8" drone. 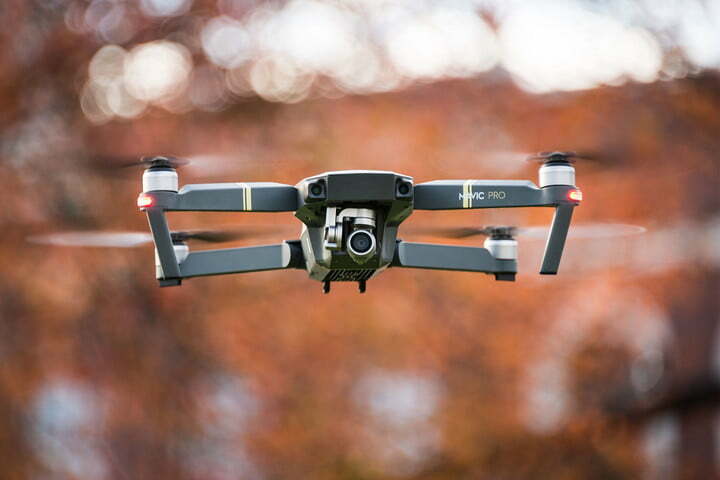 For the more time efficient production we offer an integrated camera drone option utilizing the latest Hollywood grade drone camera at 5.2k quality using the "Inspire 2" drone. Please read on to get more info on our available cameras and drones. 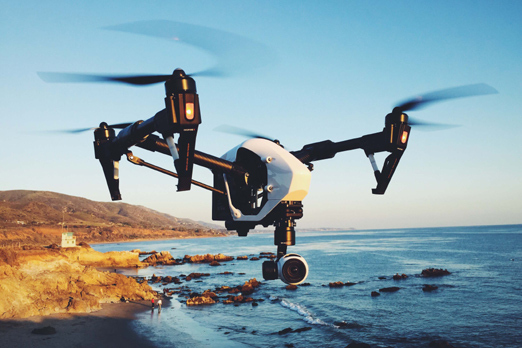 For smaller aerial media projects with lower budgets or in tight spaces we offer smaller lower cost drone options such as the "Inspire 1" drone or the "Mavic" drone. 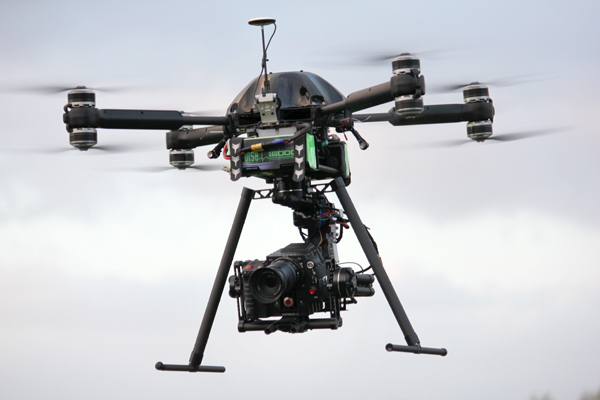 If you're not sure what drone and camera system you want to use for your video production we can help you choose one. Please contact us and we will be glad to help you choose the drone that's right for you. -This is a large heavy drone and should be flown in an open area or on a secure movie set. -Client supplies camera for this drone only, a test is recommended before the shoot. -Single operator controls. Pilot controls the aircraft and the camera or..
-Possible dual operator controls. With separate controls set up for camera operator. -Flight time approx 5-8 min per battery. Many batteries available. Recharging as needed. -HOLLYWOOD GRADE VIDEO makes this drone the best quality for high end productions. -Integrated Camera system saves prep time and give you more airtime than our "SkyJib"
-Takes 20.8 megapixel still photos. Using CineCore 2.0, the Zenmuse X5S records video at a maximum resolution of 5.2K/30fps in CinemaDNG 12bit1, 5.2K 30fps Apple ProRes 422 HQ and 4K 30fps Apple ProRes 4444 XQ (no alpha)2. Additional recording options include video in 4K/60fps using H.264 or over sampling video in 4K/30fps using H.264/H.265, both with a bitrate of 100Mbps. -Typically flown for features films or television commercials. -Typically flown for indoors, tight places. -Can be used in hand for ground based shots that are fully stabilized on 3 axis. -Can also be mounted on a vehicle or boat. Can be used to shoot from helicopter or airplane. -Single operator controls. Camera man controls the camera tilt, roll, ect. or..
-Side shooting format via manned helicopter or airplane. -We are insured up to 2 million and can have your company listed as additional insured. -Based on your needs you can have a 1 - 3 man team available for your production. 1. Professional Licensed Part 107 Drone Pilot. Single pilot operations ok based on client needs. 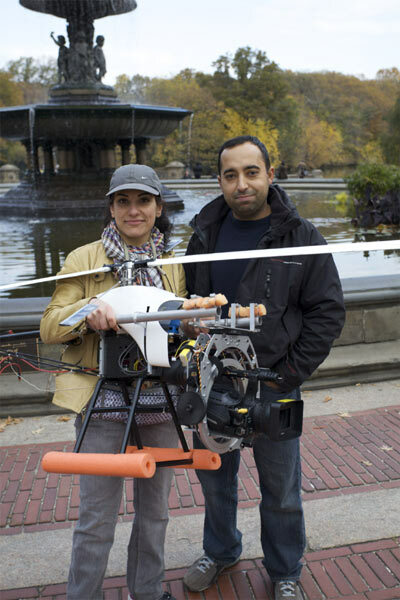 The pilot can control the cameras basic movements and fly the drone. 2. Professional Camera Operator. For more complex camera moves a camera operator is used to control camera tilt, roll and pan movements independent from pilot. This is needed for complex movements and action shots. 3. Safety Spotter. An experienced safety spotter is used to ensure the safety of the flight. 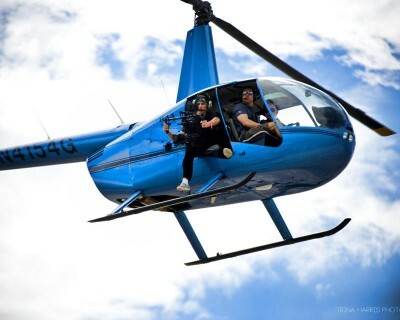 See that old helicopter and the SONY EX1 mounted? Yea we been doing this long before the recent drone craze. Over a decade ago long before drones existed we invented a way to produce aerial media. Experience matters. Are you a Director or Producer working on a Feature Film, Television Series, Documentary, Music Video, Commercial or other type of Video Production? If so then you already know the benefits of an aerial perspective for your production. Simply put we can fly where no one else can... and when no one else can... for example we can take off on five minutes notice if needed. 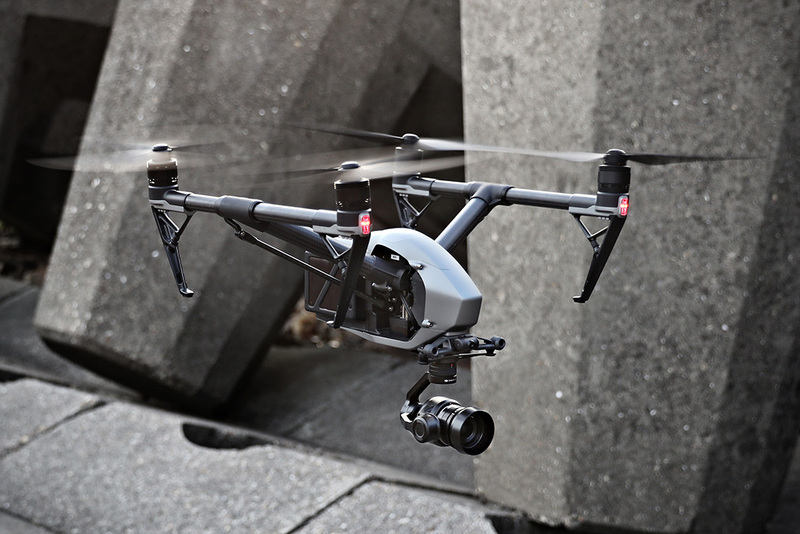 Our specially designed remote drone camera system can also fly through narrow areas such as city streets or natural obstructions at low or high altitudes. We can operate in places where a full sized helicopter cannot access safely. SkyDroneUsa can also fly closer to subjects and perform shots too dangerous for a full size aircraft. Please see our FAQ page for more details. A full size helicopter can cost many thousands of dollars. For some productions aerial photos and video may not be a consideration due to budget limitations. SkyDroneUsa opens whole new world to productions that other wise would not be able to have aerial clips in their production. We are based out of New York and we travel the USA and internationally as well. We have the ability to broadcast live from our flying drone to television any live event in full HD as well as online to YouTube, television, news, sports, concerts and more. - National Geographic Channel "The Incredible Dr. Pol"
- Travel Channel - "Insane Coaster Wars"
- Many many more... .too many to list going back over a decade. - Many many more...too many to list going back over a decade. New York State, New York City, Brooklyn, Queens, Staten Island, Bronx, Manhattan Long Island, New Jersey, Pennsylvania, Connecticut, Massachusetts, Delaware, Maryland, Virginia, North Carolina, South Carolina, Georgia & Florida. We are available to travel to all other locations in North America. View our aerial video gallery.